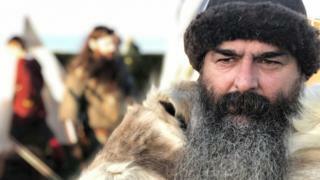 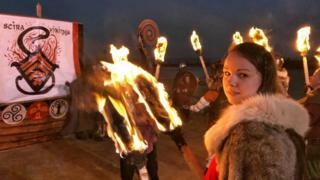 Image caption Magnus Sheildbreaker, the Viking name used by Richard Mehmed from Lowestoft, said events like Scira Festival are about "linking with our ancestors"
A seaside town in Norfolk has celebrated its Norse heritage at its annual Viking festival. 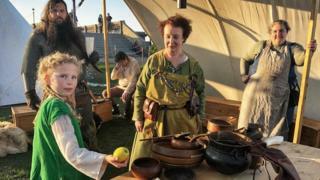 The Scira Festival in Sheringham included battles, fire-breathers and the creation of a Viking village. 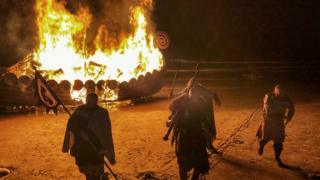 It culminated in burning a 28ft (8.5m) longboat to send a king to Valhalla - the hall of slain warriors. 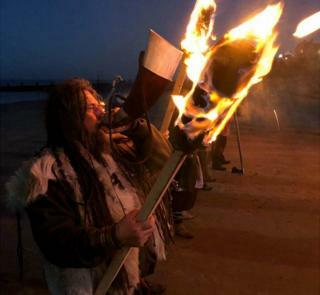 The word Sheringham is thought to be a combination of the Old Norse word for the Viking lord Scira - pronounced "Shira" - and "Heim", meaning home. 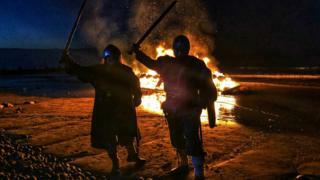 It fits with regional folklore that the area was gifted to Scira in recognition of his bravery in battle. 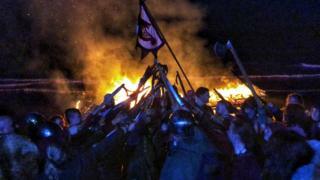 The town's deputy mayor Liz Withington said it was "really important" such events took place to help "change the idea of traditional seaside towns being [active only from] May to September". 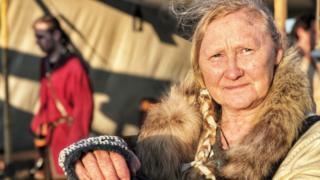 "No marauding Vikings are going to permanently take over Sheringham," she joked. 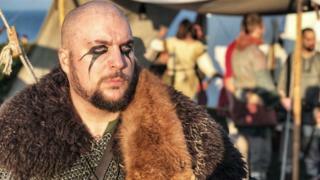 Image caption Hrafnkell, aka Steve Gilham, from Fritton in Norfolk, said attendees "love a good party"